Turnitin will have scheduled downtime for maintenance on Saturday, 22 September from 4pm to Sunday 23 September 12:30am. All Turnitin services will be unavailable during this period, including Feedback Studio and the Turnitin app for iOS (iPad/iPhone). Please ensure that submission deadlines are not scheduled on this date. Several staff members have reported seeing an error code when using QuickMarks in the Turnitin Feedback Studio. After the error code is dismissed the Feedback Studio window is subsequently frozen. This is an intermittent issue and when it occurs the only way to resolve it is to close the Feedback Studio window and then re-open the submission again from the inbox. This issue is affecting several universities and the eLearning team have reported the problem to Turnitin Support. Please note: this issue has been reported in all major web browsers (IE/Firefox/Chrome/Safari) on both PC and Mac. No reports have been received relating to the use of QuickMarks in the Feedback Studio for iPad app. While we await the resolution of this issue, if you encounter this problem, please send the following information to the Service Desk via email. Which web browser were you using at the time? What type of computer were you working on? E.g. PC or Mac, at work or at home. Which submission point was it? The name of the Turnitin submission point. What date/time did the problem occur? On the 1st of August 2017 at around 6pm GMT the document viewer in Turnitin, which is currently where essays are reviewed and marked, will be upgraded to the new Feedback Studio. This change will be implemented across the UK, some British HEIs have moved to the Feedback Studio already, as have HEIs in the United States. Any submission points created prior to the update will transition over, they do not need to be recreated. If some student assignments are marked in the current version, then they can be picked up and moderated in the new version without issue. If QuickMarks are applied to a paper in the current version they will be viewable and editable in the new version they just won’t feature the marker’s initials as they were created prior to that feature being available. The way that students submit to Turnitin via studentcentral will not change. The way that staff create submission points/inboxes and mark work will not change. The route by which students get to their eFeedback in Turnitin via My Grades will not change. Changes for the most part are limited to visual improvements and mobile compatibilty for students. See this blog post for more details. The option to generate a code for the Turnitin for iPad app will be available via the information “(i)” button on the right after the upgrade. Turnitin have advised us that they will be carrying out maintenance on the service on Saturday 5th August, from 3-9pm. The service will be completely unavailable during this maintenance window (including the Turnitin for iPad app), and we therefore recommend avoiding scheduling submission deadlines to fall within this period. On Friday, 23rd of October I attended the Turnitin User Group in Westminster, London. The event focused on recent organisational changes at Turnitin, as well updates that we can expect in the forthcoming major release, Turnitin Next. Here is a summary of news from the event. Is currently slated for introduction from March 2016 onwards although this may change based on technical conditions. The introduction will be gradual and staff will be allowed to switch between Next and the current version of Turnitin until they are ready to use the new user interface. When I say that the interface is new, it isn’t that new, it is really an update of the current interface; not so different that you won’t recognise it. Here is a sneaky slide image that I took for reference. 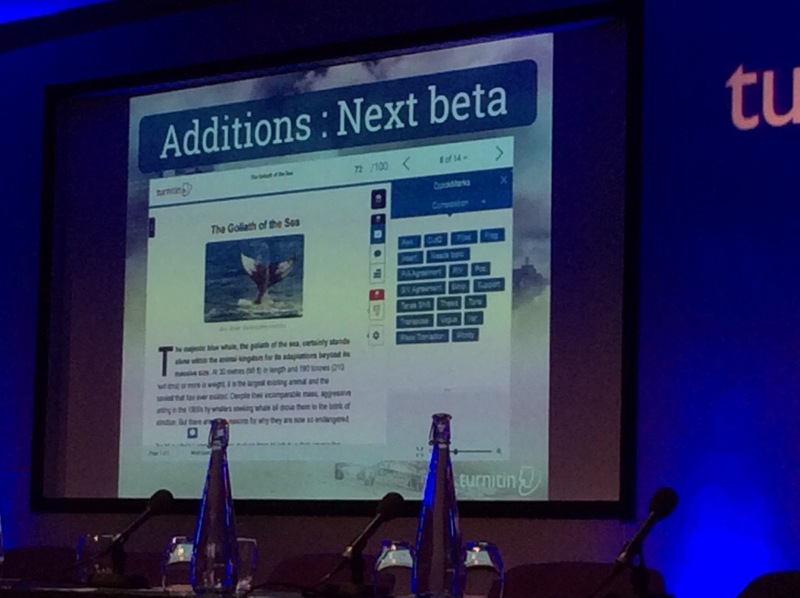 In the coming months we will have access to a BETA version of Turnitin Next. During this period we may be able to give interested staff access to the BETA (with the option to switch between current and Next). If you are interested in taking part in this testing window, please contact me at: fdotmacneill(at)brighton.ac.uk. Please note: not all these functions will be available in the first release of Next. There will be iterative updates which introduce new functions. The new Evaluation Viewer (this is their terminology, we normally call it the document viewer) this is what you see in the screenshot above. The initial viewer revamp will be for staff, the student version will follow later (estimated 2nd quarter of 2016). A new version of the Assignment Manager (submission inbox etc.) is planned for the first quarter of 2016. There is also a new emphasis on accessiblity at Turnitin, with the adoption of a new Voluntary Product Accessibility Template (VPAT) with the Paciello Group. Turnitin has acquired a couple of tech companies and associated technologies. They also have plans to research certain areas. Here is a quick summary of their plans over the next year or so. Q4 2015: Turnitin have acquired MOSS (Measure of Software Similarity) a command line tool for detecting code plagiarism. They hope to integrate this into Turnitin eventually, but may release it to the Turnitin community as-is to begin with…Stay tuned! Turnitin have acquired LightSide (Pittsburgh, USA) and their developers who specialise in machine learning technology now work for Turnitin. LightSide have managed to create automated formative efeedback based on analysis of papers that have already been marked. This is currently only available at the Secondary Ed level in the US and is designed as a way to help students to improve their writing over the course of subsequent drafts, with automated efeedback based on set criteria. It is not designed to replace real feedback from intructors but to provide supplementary feedback for the drafting process (which is something that generally would not be marked). I’ll be interested to see where this goes in the future. Plans include better syncing and improved password/login. They also plan to add Touch ID support in the future and a student viewer iPad app. Since Turnitin was acquired last year by Insight Venture Partners, they have undergone some major structural and staffing changes. Insight Venture Partners have brought in new executive leadership and have put in considerable investment. They now have a Director of User Experience Design, Steph Butler. This is a major step in the right direction in terms of making Turnitin products as user-friendly as possible. They have put a lot of work into improving stability. They are working on improving their customer service and communication with customers. They have moved as a company to an Agile development framework, namely Scrum. This model supports the introduction of small changes and improvements, more often, and means that functions will be added to Turnitin products in iterations, called releases. So hopefully we will see these features in a future release! Thanks for reading. Please feel free to leave comments below, if you have questions.